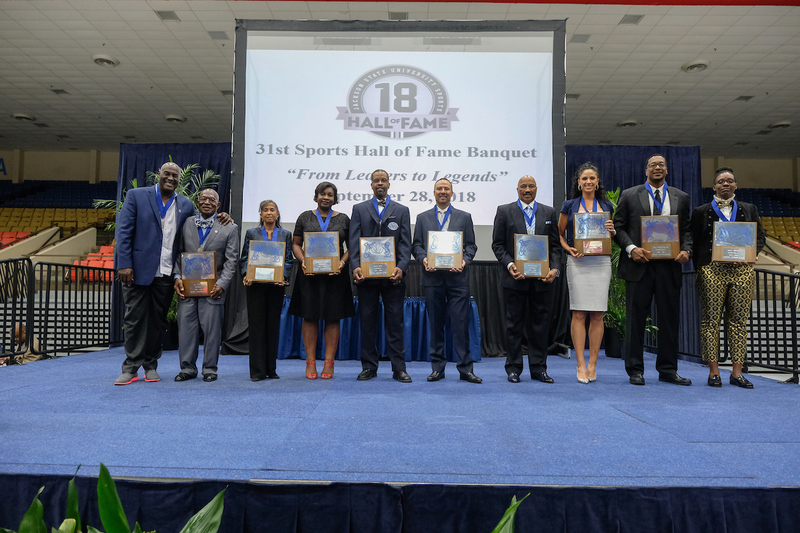 Jackson State University inducted 10 accomplished performers into JSU’s 2018 Sports Hall of Fame on Friday, Sept. 28, in the Lee E. Williams Athletics and Assembly Center. 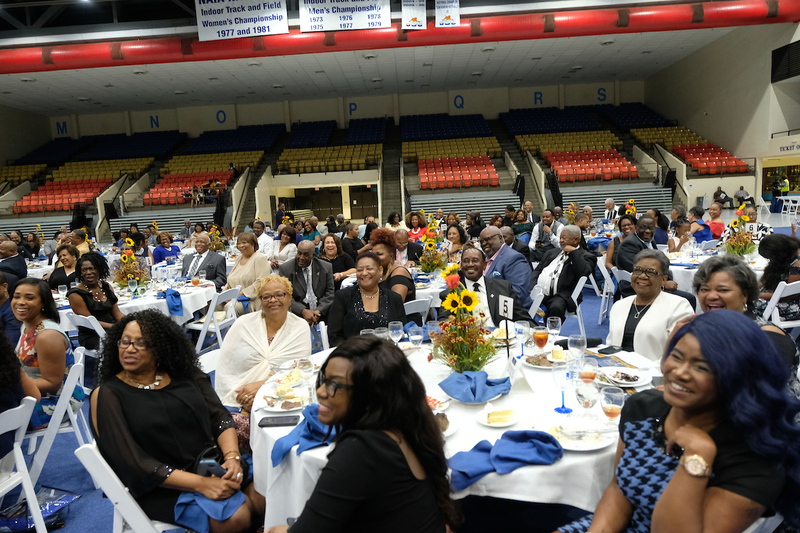 Each of the honorees were presented with a plaque and medallion and their photos will appear in JSU’s Hall of Fame with all the other great inductees who preceded them. 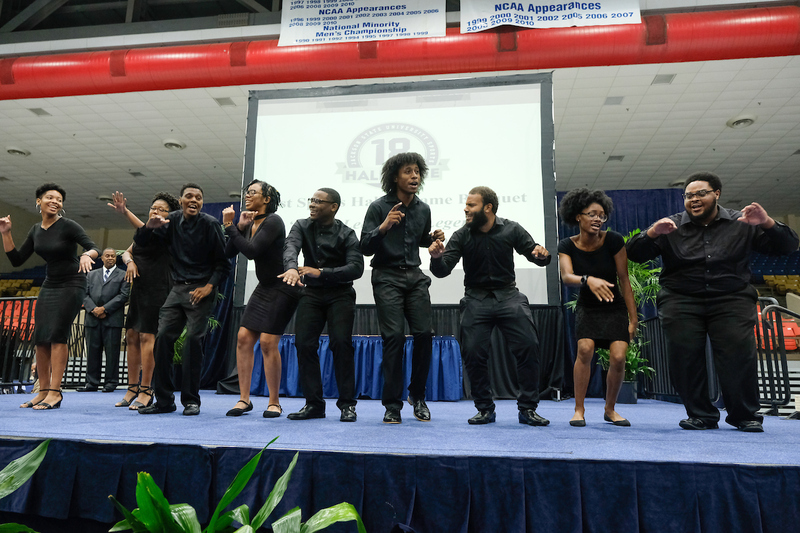 Program emcee Rob Jay, JSU’s executive producer of Sports Media, asked honorees to express their feelings about their induction, share memorable tales about their athletic skills and conquests as well as their experiences at JSU. Shasta Averyhardt, golfer: “The fact that my name is going to stand next to the greatest athletes of JSU is extremely overwhelming and very humbling. Some of my best moments were formed on the golf course with my teammates during practice sessions and traveling to tournaments.” Averyhardt also recalled competing against non-conference schools and still being victorious. They’re moments she says she’ll cherish for the rest of her life. ATHLETIC HISTORY: She won nine collegiate golf tournaments, including four individual SWAC Conference Championships. She led the team to four SWAC Team Championships that berthed a bid in the NCAA Regionals, 2005-2008. In 2011, she became the fourth African-American woman to gain membership on the LPGA Tour. 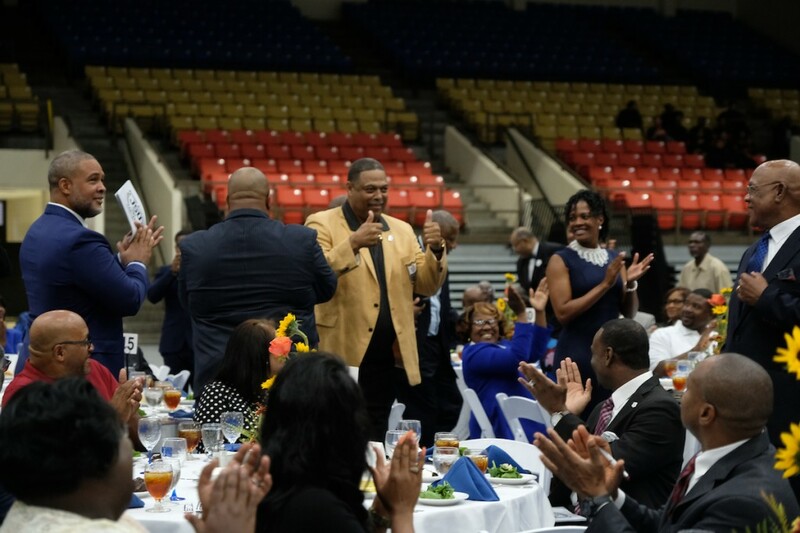 Kevin Dent, football: The National College Football Hall of Famer paid homage to many of the greats who preceded him, including Robert Brazile and Vernon Perry. “My most memorable moments are having an undefeated season and never losing a SWAC game” during his time at JSU. ATHLETIC HISTORY: He led the nation in pass interceptions; he garnered 11 as a sophomore and returned two of those for touchdowns. Ultimately, he would become Conference Defensive Player of the Year twice. JSU Tigers won four consecutive SWAC Championships under the defense of safety Dent. A.J. Montecinos, golfer: “This induction is extremely humbling. I feel honored. … Born in Chicago, my father used to take me to the car shows to see Walter Payton, so I was a huge Walter and Chicago Bear fans. 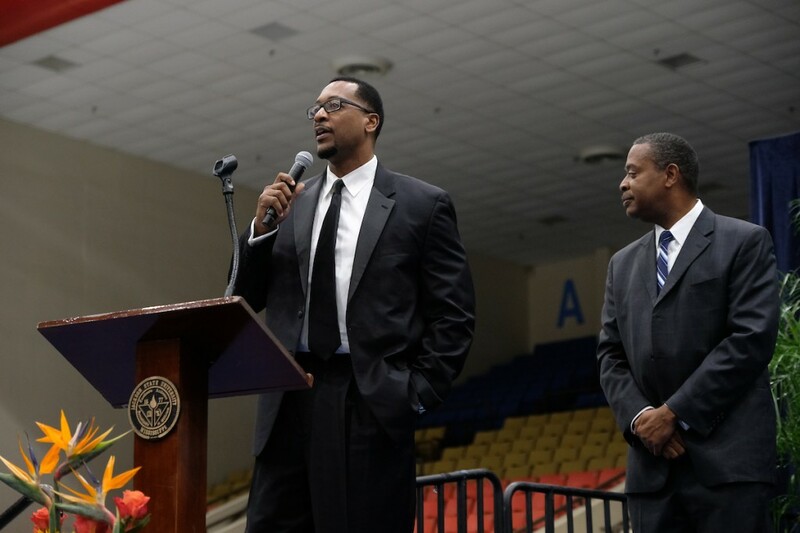 To be standing here among all these guys, Coach and the Payton family, who are like a second family to me, I am extremely humbled.” Montecinos said his memorable moment at JSU goes back to 1996. 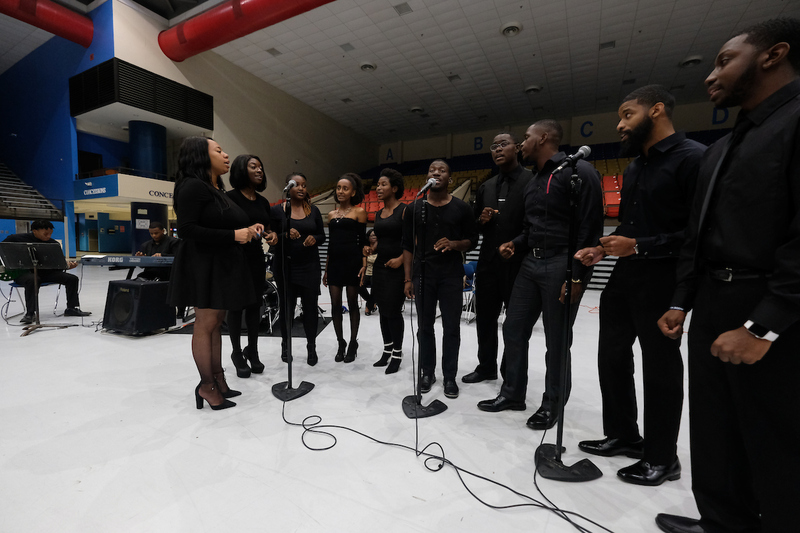 “Then, we broke down the color barrier and were the first HBCU to get inducted into the NCAAs,” he said. ATHLETIC HISTORY: He earned a PGA Championship and was a caddy for Y.E. Yang, who competed against Tiger Woods. Narah Jean Oatis, supporter: “This is indescribable. It’s awesome. Humbling. It’s a blessing to be able to receive your flowers while you’re living,” she said. Oatis recalled her experience with the J-Settes, who performed at Motown many years ago. 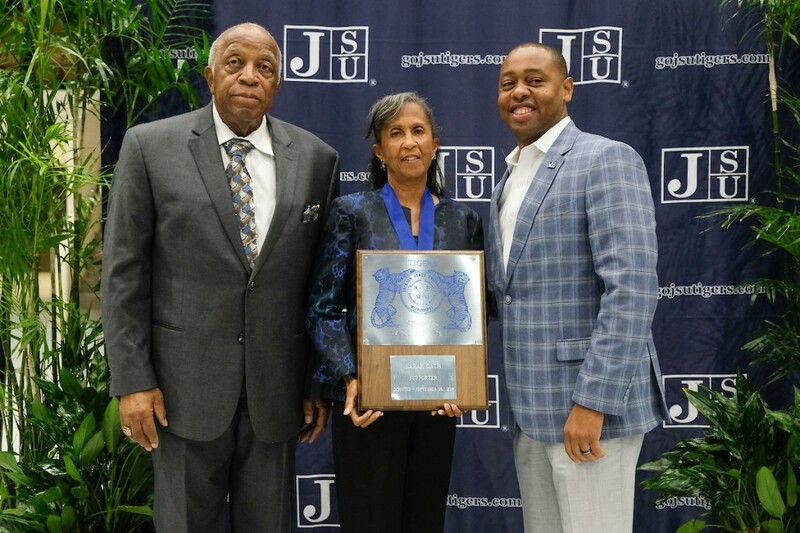 Also, her cheerleaders won SWAC recognition in its first-ever competition.” ATHLETIC HISTORY: JSU Department of Athletics presented Oatis an Award for Dedicated Service in 2008 after 32 years of commitment related to JSU athletic performances. She became director of the Sonic Boom of the South’s Prancing Jaycettes (now J-Settes) in 1975, devoting 21 years to the dance group. She also worked with JSU Twirlers and cheerleaders. Tera Sheriff, basketball: “We earned a bid to the NCAA basketball tournament. It was one of the most prestigious honors. 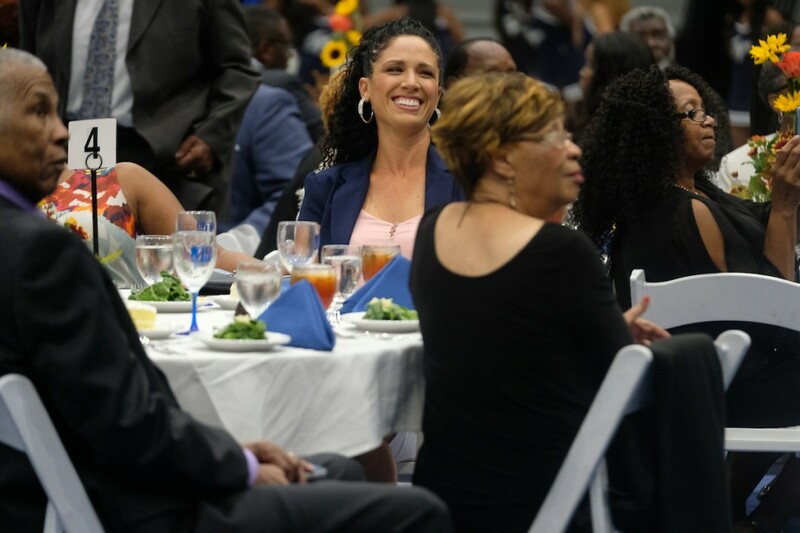 We got whooped … but (the bid) was the first time in JSU history.” ATHLETIC HISTORY: She was a key part of the Lady Tigers’ advancements to SWAC championships, with an appearance at the NCAA tournament (1995). Sheriff was the only player in the nation to rank in the Top 10 in scoring and rebounding (1994-1995). Eric Strothers, basketball: “This is a great honor and a blessing,” he said. 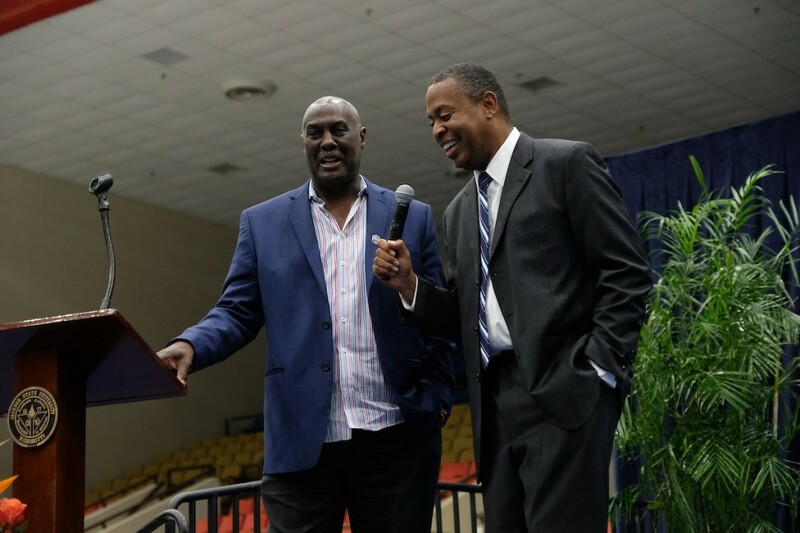 As a key player on the team, Strothers reflected on his work to perfect his offensive rebounds, especially while playing alongside Lindsey Hunter, a JSU Hall of Famer and former Detroit Piston. Strothers’ scoring average placed him in the JSU 1,000 Points Club. ATHLETIC HISTORY: He was named one of the best mid-major assistant coaches in NCAA Division I basketball by collegeinsider.com. In 2010, he was tabbed SWAC Assistant Basketball Coach of the Year. M.C. Taylor, football: The skilled athlete helped his team win a national championship. Consequently, the squad earned the nickname of “The 1962 Dream Team.” ATHLETIC HISTORY: He played on two conference championship teams and on a national championship team. John Walker, football: “There were a lot of great players to come before me. JSU coaches were very fair and gave me an opportunity to prove my skills. … I had an opportunity to learn a lot from a lot of good players, too,” he said. ATHLETIC HISTORY: After being drafted by the NFL’s Atlanta Falcons, his plans were to play about 12 years, retire and then start a business. All of that changed after being drafted in 1968 by the U.S. Army. He was inspired to coach after active duty. At JSU, he lettered four consecutive years. He was a linebacker, tight end and also the long snapper center. LaTrenda Watson, softball: “This is an unbelievable moment,” Watson said. 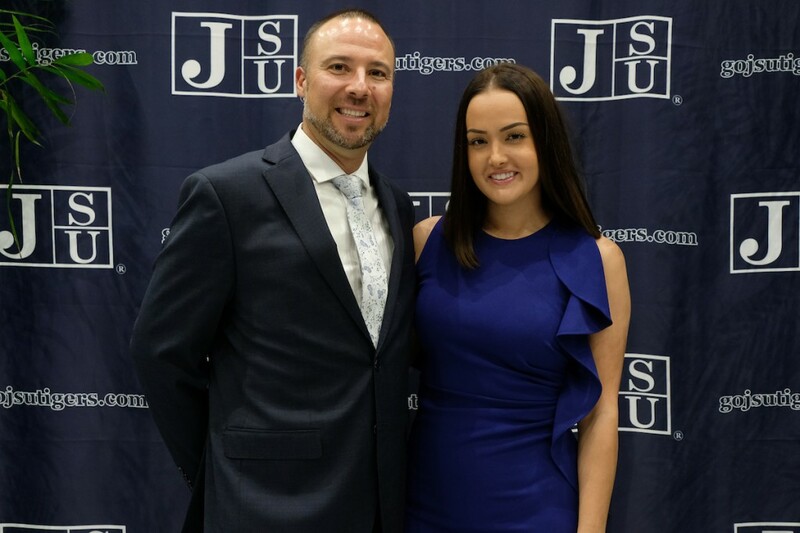 The gifted competitor recalled being an all-around athlete who was proud to part of JSU’s first softball program. ATHLETIC HISTORY: She was a four-year letter winner in softball. In 1999, Watson received SWAC All-Tournament Team; SWAC Eastern Division Most Outstanding Hitter; and Player of the Year. She was 29th in the nation for Division I for a softball batting average of .418. Rickey Young, football: “It’s humbling,” he said of his induction. “I’m grateful to come back and be among the people you love and care so much about.” For helping him strive to be the best, he cites the influence of coaches and players such as Robert Brazile, Walter Payton, Jackie Slater and Vernon Perry. “We had so many people who worked so hard together. It was gratifying. This school has provided me with so much and so many things that I’m thankful for. I came here at 17, graduated, left and went on to do some things that I probably would have never had an opportunity to do. … Life is so strange. There are so many things that come to you that you don’t know it’s coming. You just show up, and it happens. You work hard and do things that you’re trying to do. You treat people like you want to be treated, and good things just come to you. It’s so simple. I love my life that way because a lot of good things have happened for me and to me.” ATHLETIC HISTORY: In the NFL, Young played in 131 games, rushing for nearly 4,000 yards and 23 touchdowns. In his nine seasons in the NFL (1975-1983), Young did not miss a single game, playing in all 131 contests with his teams in that span. Meanwhile, Athletic Director Robinson stressed the significance of the inductees’ lasting impact on the world. 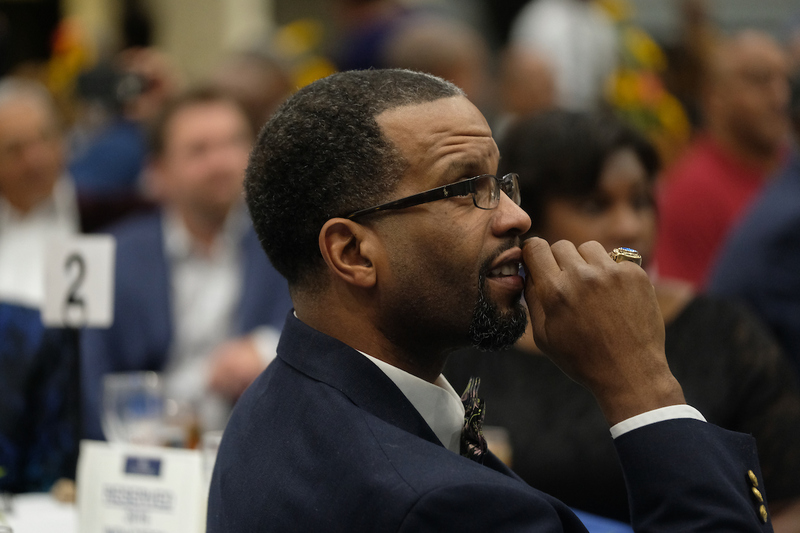 “We just congratulate each of you for making a difference in the lives of our youth through your hard work and determination on the playing field, in the classroom, throughout the community and in your professions,” he said.